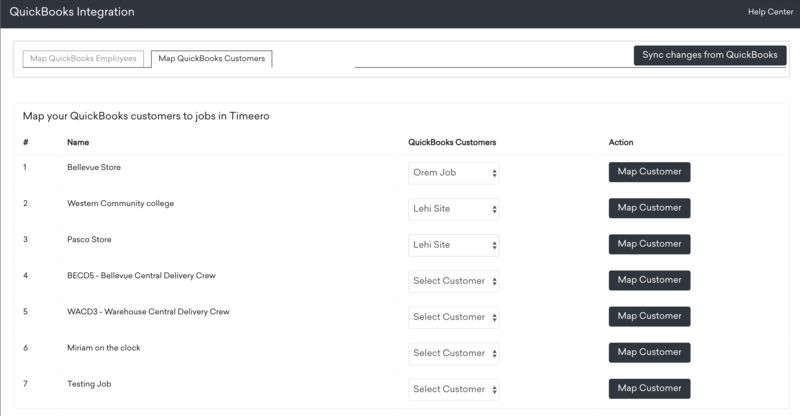 You can map your Timeero jobs to QuickBooks customers after you have successfully connected QuickBooks. A job in Timeero represents a customer in QuickBooks. Matching Timeero Employees to QuickBooks is simple. Simply select the QuickBooks employee and click the Map Employee button to map the employee. If QuickBooks customers or employees aren't showing in Timeero, simply hit the Sync changes from QuickBooks button to force QuickBooks customers and employees to reflect in Timeero.